Australia has a long way to go before all employees are equally able to follow career and family goals. The old adage ‘can women have it all?’ – children and a career, and, perhaps, some time for herself – is often raised in workplace policy conversations. But is it the right question to ask? A more relevant question may be ‘Must women do it all?’ If the answer to the latter is no, then perhaps the answer to the first question can be yes. If, however, women must do it all, then to have it all may no longer be desirable. As we advocate for the economic and social benefits of a diverse workforce, we need to address the underlying impediments for women and the responsibility of policy makers and employers to provide an equitable framework. Only then can we hope to achieve a workforce where all employees are equally able to pursue career and family goals. What I mean by ‘do it all’ is work full time; do all (or most) of the caring work at home – organising childcare, transporting children, staying at home to look after an ill child – and household work. The logical answer to ‘Must women do it all?’ is no. Why should women feel more responsible for all of the above when most children have two parents? In practice, however, the answer to this question often seems to be yes. 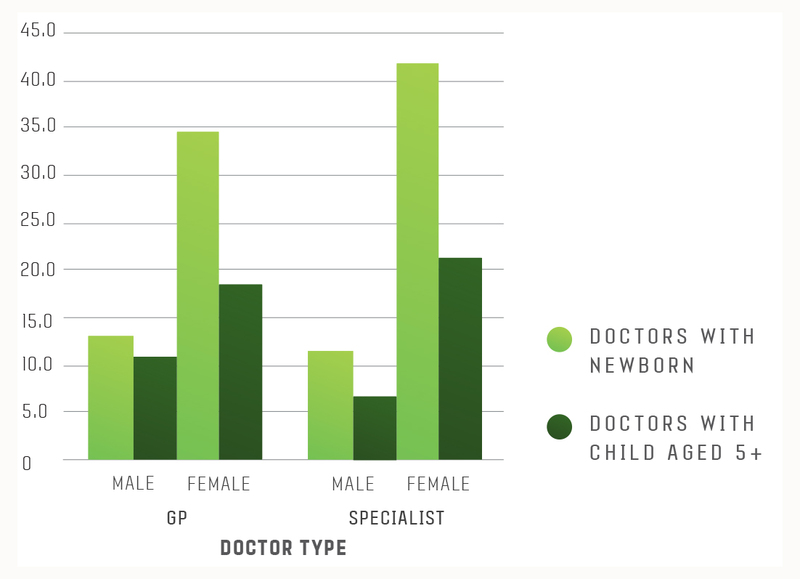 Even among very highly trained individuals, such as medical doctors, women with children aged 0 to 4 are more likely than men to work part time: 79 per cent of female GPs and 65 per cent of female specialists work fewer than 35 hours per week compared with 16 and 8 per cent of their male counterparts respectively. Women are also much more likely than men to agree with the statement that their employment is restricted due to lack of access to childcare. Women and men are expected to perform equally in the workplace but the expectations of women as homemakers have not kept pace with this change. Source: Own calculations from the Medicine in Australia: Balancing Employment and Life (MABEL) data. There is economic and social value to be found in a more equitable approach to market work, household work and caring tasks. In a time where divorce is relatively common, specialising in household work and caring at the cost of market work is not in women’s interests, but there is also a price to pay for society when women with little labour market expertise and earning power become more reliant on the state. However, regardless of this, when highly capable women exit the labour force (even temporarily) or downgrade the occupation they choose because of familial pressures, there is a loss to society. Things are changing, but not quickly enough. Government policy, despite talk about increasing female labour force participation, does little, and often even seems to act counterproductively by maintaining policies that encourage women to become stay-at-home mums, such as Family Tax Benefit part B, which penalises the secondary earner on return to work. Women need supportive partners who are willing to share the workload at home and in the labour market. However, to enable partners to be supportive, the Government and employers need to put policies in place that do not penalise such behaviour. For example, family-friendly policies should be truly available to men and women, so men can stay at home with a sick child without being frowned upon. Access to part-time hours should also not be a hurdle. Both parents could work four days a week, reducing the number of childcare days required and keeping both parents in the labour market for close to full-time hours. Paid parental leave (PPL) has had a positive impact, but current policy reviews may undermine its success, such as proposals to withdraw government leave payment dollar for dollar if the parent receives employer-paid parental leave, and stricter income tests. The parental leave debate is often quite confused, with paid parental leave seen as a welfare payment rather than a work entitlement, as is the more common view in European countries. It is true that PPL allows women to stay at home for a few weeks after birth without financial hardship and, as such, can be seen as income support, but paid leave also plays another role. Recent research shows that although women with paid leave at first delay return to work, after six months they return to work at a faster rate than those without paid leave (in the table, the solid red line overtakes the dotted blue line). One year after birth, 73 per cent of women with PPL have returned to work versus 69 per cent of women without PPL. We also found that women with paid leave have a stronger attachment to their job (and employer). Source: Broadway, B., Kalb, G., McVicar, D. and Martin, B. (2016) The Impact of Paid Parental Leave on Labour Supply and Employment Outcomes, Melbourne Institute Working Paper no. 9/16. In Norway and other Scandinavian countries, mothers’ labour force participation is substantially higher than in Australia. High-quality childcare is widely available and at much lower cost than in Australia. The role of men in caring is supported by policies around PPL, with 10 weeks of ‘mandatory’ (use it or lose it) leave – about 20 per cent of total leave available – designated to the father. Such expenditures are clearly an investment in the country’s future by ensuring economic growth, high productivity, and a well-adjusted and educated next generation. That seems money well spent to benefit the whole population, and the disincentive associated with somewhat higher tax is much less than the disincentives for mothers of young children in the alternative scenario, where a few years of child rearing potentially produce a lifetime of relative disadvantage. So we – men and women – could, with the right supports, indeed achieve work-life balance. So why does no one ever seem to wonder whether men can have it all? Guyonne Kalb is professor at the Melbourne University of Applied Economics and Social Research with extensive experience in labour economics and social policy.